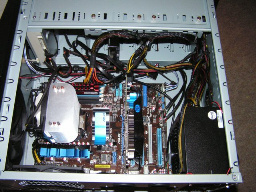 In short we are a small, family run business supplying computer maintenance and repairs services as well as many other related services. Click here for more details on what we can offer. We are a mobile PC service local to East Kent, based close to Ashford. As a partnership we often work together which means you get two heads for the price of one! Stewart has been involved with computers since getting his ZX81 whilst at school, he studied for a HNC in Electrical and Electronic Engineering at High Wycombe and Woolwich. Samantha has also been involved with computers from an early age; she has an MSci in Astrophysics and Maths from Keele University. We offer a number of PC, Laptop & Games consoles repair & maintainance, tablet and smartphone setups and tuition services. Click the links below to see more detail. Smoking is bad for your PC! Click below for more pictures. Copyright © ComputerBlues 2014. All Rights Reserved.